A typical hydraulic cylinder have a larger extending force than retracting because of the area difference between full bore and annulus sides of the piston. Hydraulic regeneration system can be use to equalize the force. The example hydraulic regeneration circuit in figure above employs a differential cylinder with a full bore/annulus ratio of 2:1. 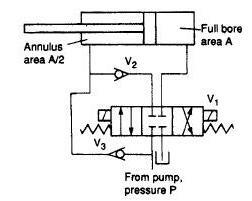 During the cylinder extension sequence, line pressure P is applied to the right side of the piston giving a force of P x A, while the left side of the piston returns oil via check valve V3 against line pressure P producing a counter force P x A/2. Therefore the net force to the left is P x A/2. When retraction sequence is executed, a force of P x A/2 is applied to the left-hand side and hydraulic oil from the right side returns to tank at minimal pressure. On this circuit the extension and retraction forces are equal at P x A/2.